Coronado a la bonne nourriture et sont ouverts pour le petit déjeuner et le déjeuner! Le Summer Sands dispose de 2 piscines chauffées comprenant un espace pour enfants clôturé. 6 barbecues au gaz sont disponibles pour griller le poisson que vous avez pêché plus tôt dans la journée. Golf de classe mondiale et la pêche sont à seulement quelques minutes en voiture. La promenade est à moins de 3 km de notre unité. Alors, même si vous êtes à quelques pas de tout ce que Wildwood a à offrir, notre emplacement est calme et loin de la foule. C'est une plage gratuite, donc pas besoin de balises de plage. De plus, chaque bloc a un portable avec son pot. Encore une fois, les draps et les serviettes ne sont pas fournis et peuvent être loués sur place. Nous avons également un condo situé au 4ème étage du dernier étage qui a été rénové cette année. S'il vous plaît, cherchez # 4960498..unité 415 ... Ocean Sunrise. My wife and I booked a last minute weekend and rented this condo in Wildwood Crest; the owners could not have been easier to work with! The condo has a designated parking spot, keyless entry and a great view. We could walk to the beach in under a minute. Even though the weather was not great we were able to fill 2 full days in Cape May hitting the breweries, wineries and restaurants. When we got back to the condo it offered the perfect amount of space and amenities. We would rent this again in a heartbeat! 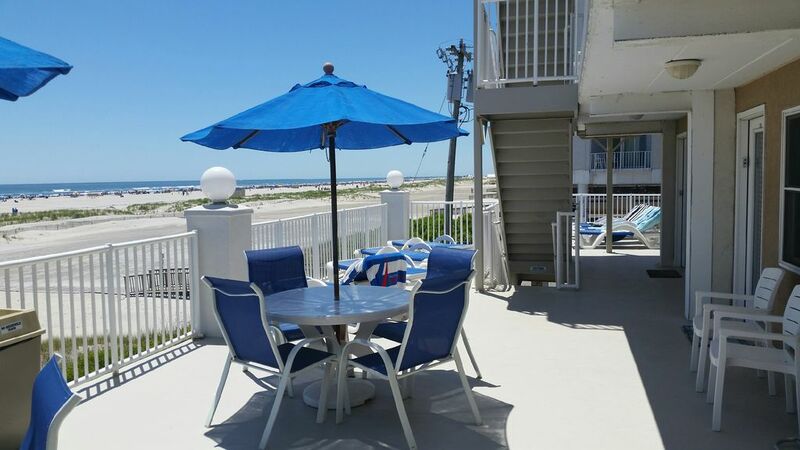 What a wonderful condo to stay in wildwood crest! We stayed for my daughters cheer competition! The owners were amazing from start to finish! The whole condo was spotless and beautiful! We would definitely recommend for future stay and recommend to anyone that is interested in staying in wildwood. We will be back soon!! Perfect weekend getaway. Rooms were clean and the place itself was overall comfy and prime location to the beach! Glad you enjoyed your stay. Please do come back one day. Very nice, comfy and cozy! Perfect location to the beach. Had a very relaxing weekend. Thank you! We had an amazing stay! Ocean front building! Under roof parking! Well appointed with a great TV! Electric fire place provided both comfortable ambiance and temperature as our stay was over the New Year’s holiday. Highly recommend for couples and small families. Thank you! Thanks for the kind review guys. So glad you enjoyed your stay. Perfect weekend getaway! My fiance and I needed a little getaway weekend and this was the perfect ! My fiance and I loved the remodeled condo. The bathroom and kitchen are beautiful! Although we only stayed a weekend, and didn't need much, the kitchen has everything you could possibly need. A full size fridge, a Keurig. Microwave, toaster, stove etc. The bedroom was a nice size and the TV in the bedroom was a nice touch. The living room was spacious and the TV was nice and big! Perfect for watching the Eagles game! The pool was closed, because it was October but it looked like a nice area. The parking space is in the PERFECT spot for loading and unloading. I would definitely visit again in the future!